To what extent do you agree or disagree with the following statement: “Halloween should be a festival for children, not adults“? 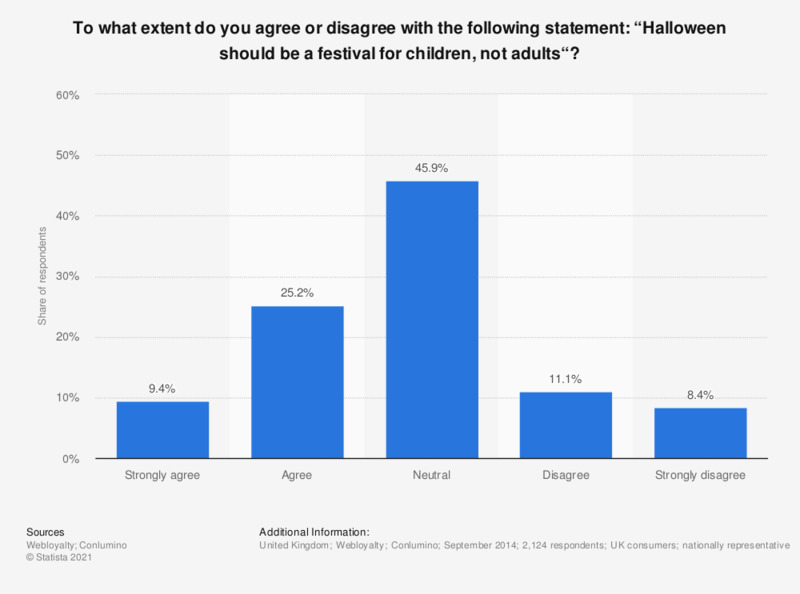 This statistic shows the results of a survey asking UK consumers in 2014 their opinion on whether Halloween should only be a festival for children and not for adults. While a third of respondents agreed or strongly agreed, just under 20 percent disagreed or strongly disagreed. To what extent do you agree or disagree with the following statement: “Halloween is nowadays as much for adults as it is for children“? To what extent do you agree or disagree with the following statement: “Halloween is a fun festival that we should continue to celebrate in the UK“? To what extent do you agree or disagree with the following statement: “Halloween is overshadowing traditional British events like Bonfire Night“? To what extent do you agree or disagree with the following statement: “Halloween is bad as it focuses on the occult“? To what extent do you agree or disagree with the following statement: “I’m indifferent to Halloween – it has no relevance to me but I am happy for others to celebrate it“? What will you do if trick or treaters knock at your door?